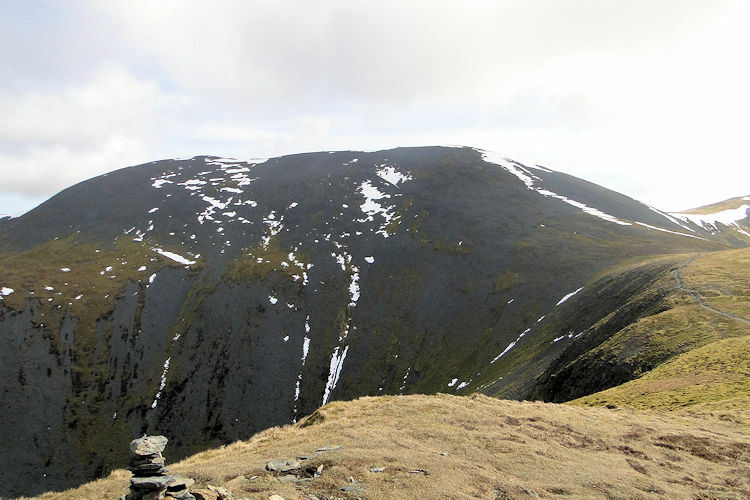 Summary: This adventurous walk is a classic ridge approach to Skiddaw, the 4th highest mountain in England which dominates the north Lake District landscape. 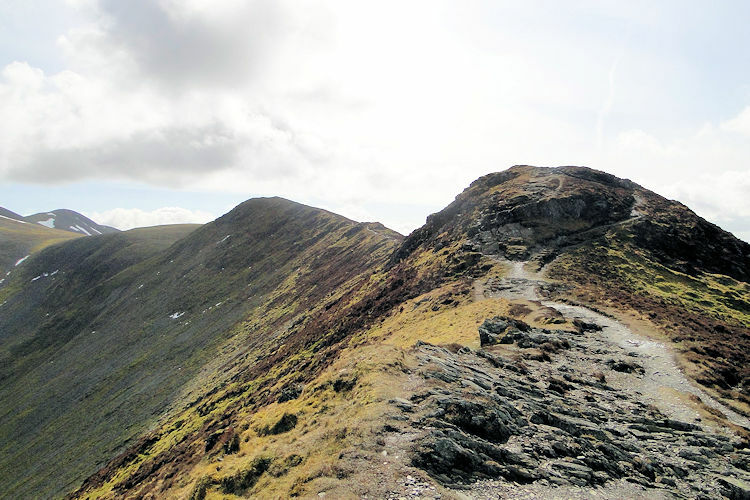 The linear route includes a fabulous ridge approach to Skiddaw and in total the walk takes in six of Alfred Wainwright's famed Lakeland Fells. 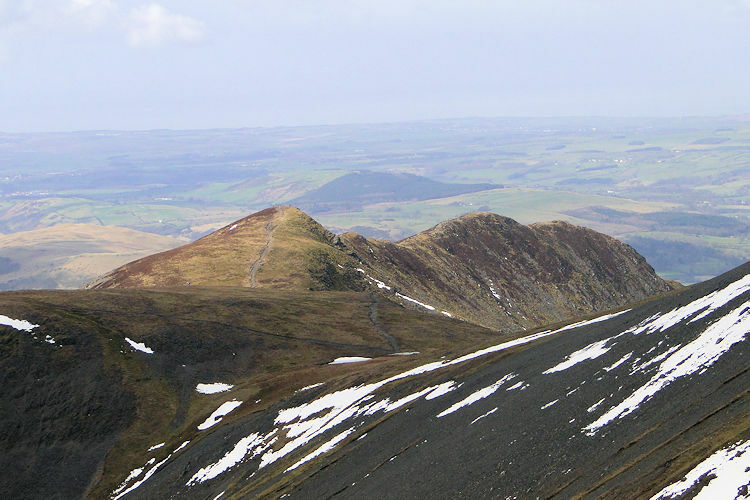 The Walk: Lil and I were staying in the Skiddaw Hotel, Keswick on their Daffodil Break deal. 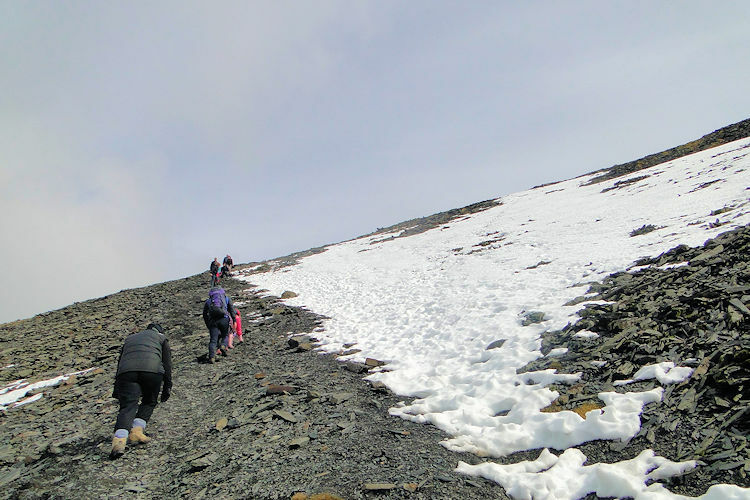 Thus I thought it was most appropriate to expedition onto Skiddaw, probably the most visited of all the famous Lake District mountains which are formed from a particular type of slate, appropriately called Skiddaw Slate. 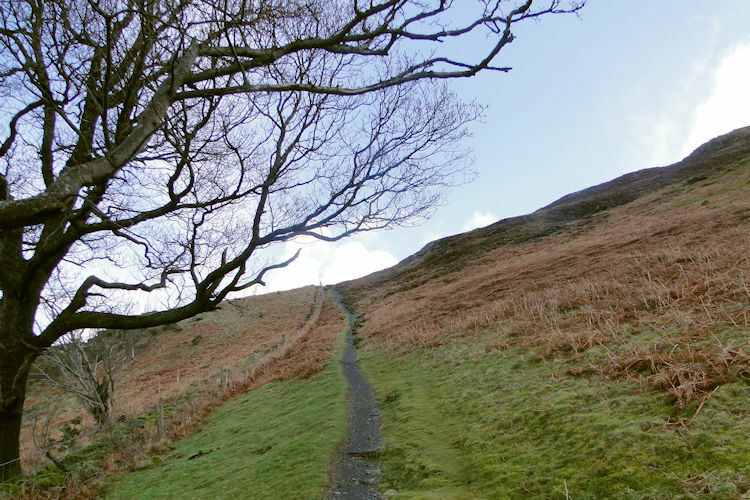 There was no way I was going to do the popular route though, the one designed by the early Victorian pioneers which consists of a wide well-made path all the way up from Latrigg to Skiddaw via Jenkin Hill. Much too boring and much too busy for me that one, I needed something more dramatic and an approach to Skiddaw which would be quieter. I found what I was looking for with this superb route. Fortunately with Lil as my taxi driver I chose to be dropped off at Ravenstone Hotel, on the A591 between Keswick and Bothel. Once dropped off I followed a track through a gate adjacent to the hotel driveway and gaped. The path skirting to the south and east of Dyke Nook plantation was a really steep start to the walk. It woke me up from my morning lethargy immediately as I was climbing steeply from the first step. I pushed myself up the incline for the weather was promised fair and I wanted to get into the open. 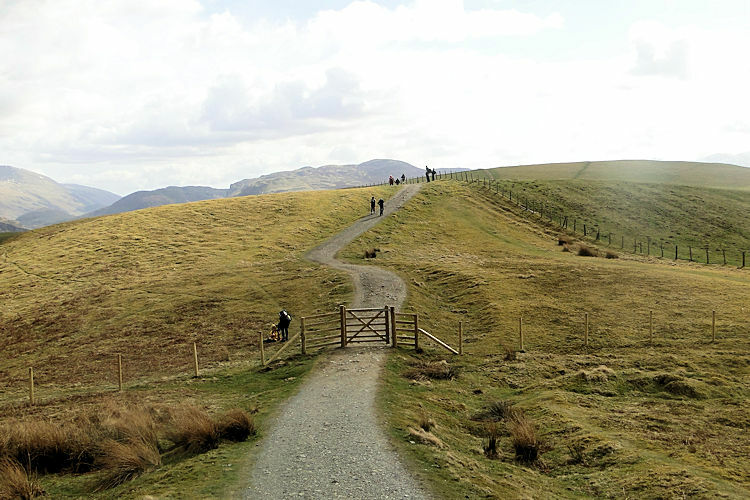 Soon, but with effort expended I reached a gate which took me onto the open fell. I had done 200 metres and climbed 80. I rested at the gate catching my breath. As I did so I could see the clouds rising and the signs of a great day ahead so as soon as I gathered myself I made my way through the gate and followed the Allerdale Ramble route I was on toward Ling How. Five hundred metres later after plenty more catch my breath stops I had climbed another 150 metres. I was jiggered for sure, this walking lark does not get any easier but the rewards inevitably push me on as I hope they do for many years to come for after this 700 metres along and 230 metres up I caught my first sight of Ullock Pike. I was ecstatic. I had plenty of encouragement to keep me going, not least the spectacular views unfolding in front of me. The clouds were lifting rapidly and the swirling cloud was revealing a wonderful ridge approach to the grand slate laden summit of Skiddaw. Immediately Ullock Pike was the draw which appeared as a majestic rounded dome from my route to it. Still I had to take regular breaks as it was a steady climb all the way to the dome. In the next kilometer of climbing to the top I climbed over another 300 metres and when I eventually reached Ullock Pike I took a well earned rest fully satisfied I was well into a fantastic day of walking. 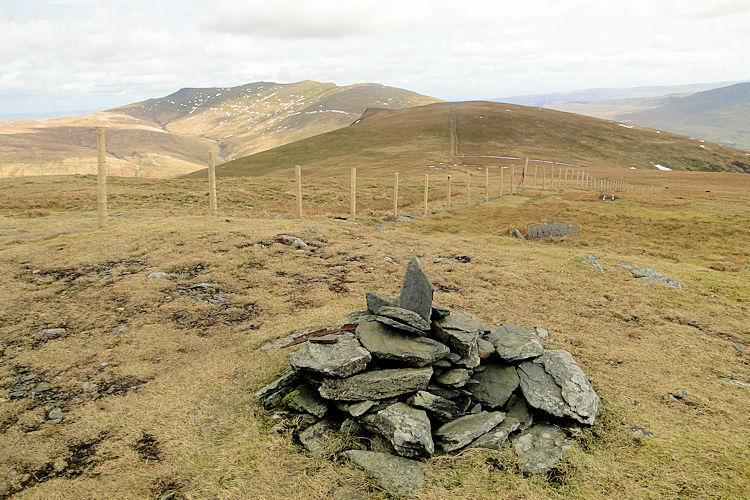 I had reached my first Wainwright Fell of six. I had walked quarter distance yet I had climbed more than half of the ascent. The thought of my work so far made the rest even more satisfying and I took in the higher views contemplatively. And what a view I had. It was tremendous with the full route to the top of Skiddaw clear to work out. On studying in detail I thought "Oh, there looks a bit of a climb yet to come...."
After the exertion of the climb to Ullock Pike from the A591 the next mile along the ridge with short climbs to Long Side and Carl Side was much easier. The mile of walking included an ascent was only 60 metres, it felt as easy as it was and I bounded along much like the new born lambs further down the slopes. A pity there were 54 years between us! Nevertheless, I felt years younger as I walked along and when I reached Carl Side I took a few moments to prepare myself for the next haul up the mountain. To paint a picture Carl Side is a flattish domed hill covered in grass. 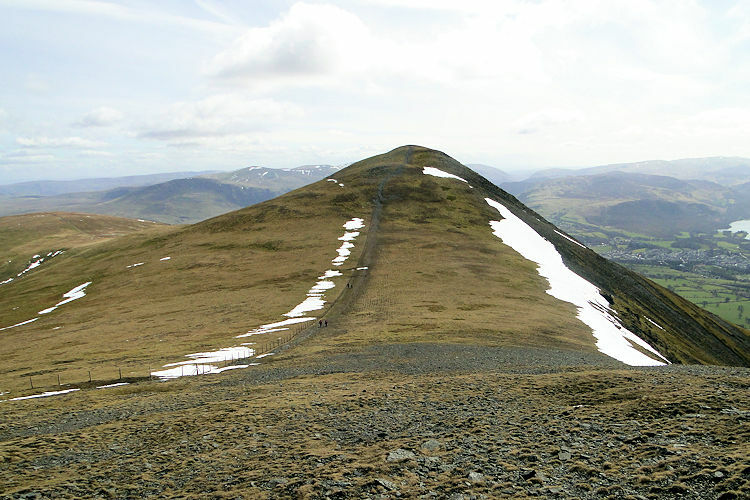 From Carl Side the final ascent of Skiddaw is devoid of grass, a grey black mound of weak slate that crumbles under the impact of feet. Ahead of me were groups of walkers struggling up the incline from Carl Side to the top plateau. I could see they were working hard, not just to make the ascent but also to keep their feet. "Here goes" I thought. It had to be done. It was as tough as it looked. The slate was as forgiving as I imagined and on the steeper parts of the climb it slid down with me. Other walkers on the slope were having the same difficulty and the cartoon character efforts of some to retain balance, including me, allowed for comic moments between us on the hill which made for light relief. A couple of times I met with families, youngsters bounding on, parents struggling behind and also the odd teenager grumbling about why they were there at all. On one occasion near to the end of the painful ascent I showed one teenager who was not impressed exactly where he was on my GPS and how far he had still to go. Fortunately for his mum who had to put up with his dismay the good news encouraged him on. Interludes like the one with the family helped pass the time and after some effort through more slate, some remaining snow patches from the long winter and some more slate we were up. 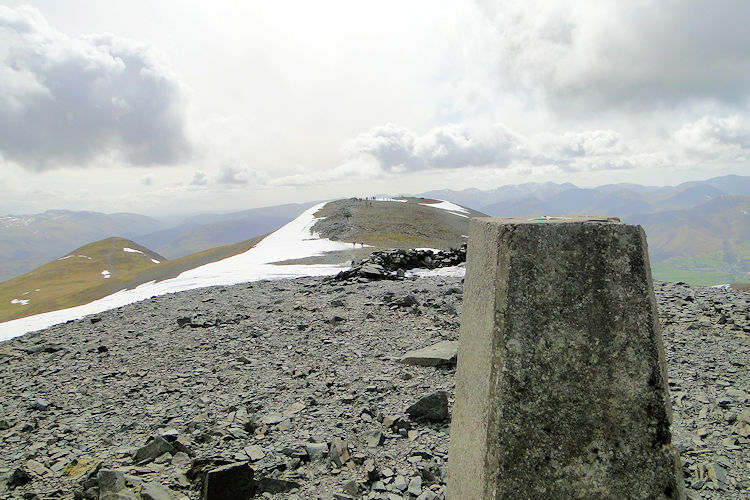 Skiddaw summit came into view and we reached the summit plateau. It was an invigorating moment. It had been a warm approach earlier on to Ullock Pike and even on the higher ridge to Long Side and Carl Side. Due to the exertions of the final ascent to the summit plateau I felt warm then too. Not now, no wonder there was plenty of snow still remaining up here, it was cold. After an approach in sunny conditions cloud obscured my time on the summit so I got to the trig point then I found a spot of shelter in the cairn circle, as did a good few others in my company on the summit. I needed a drink and a sandwich. As I tucked a couple from Eastbourne sat with me and after exchanging pleasantries the lady said "That sandwich looks tasty". "It is, and much needed after all the effort getting up here" I replied. I did enjoy it. 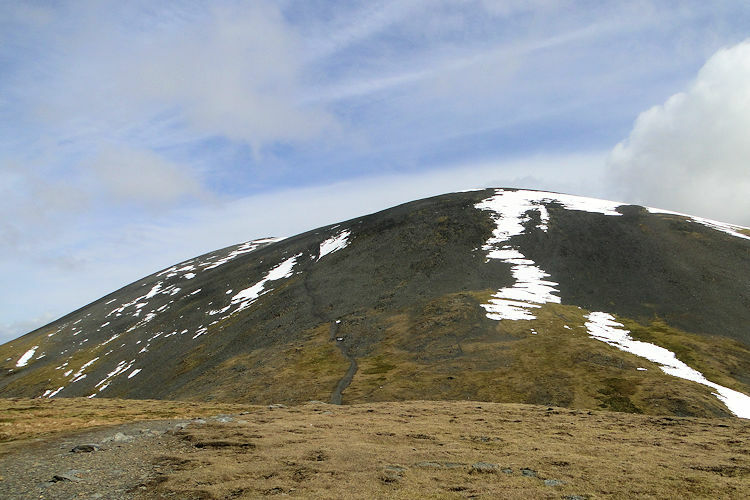 Soon, on finishing my lunch break I said farewell and headed off Skiddaw towards Little Man. It was not the last time I saw them though, I was to meet the couple again. 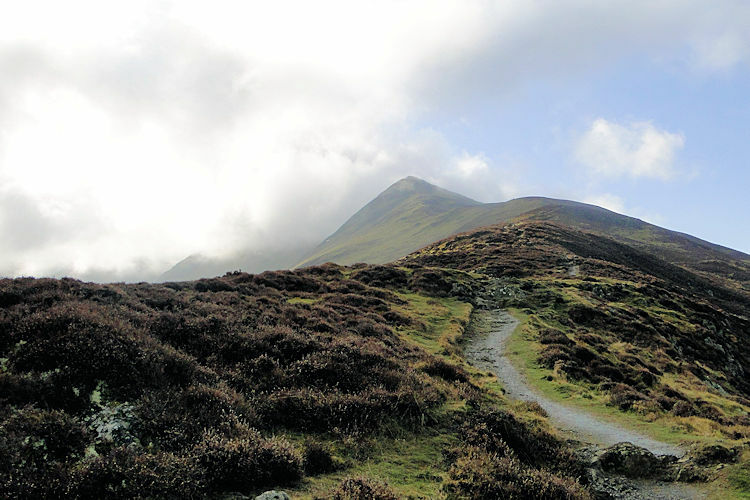 I was now in revelry, the climbing was done and the sun began to shine through the clouds again as I walked from Skiddaw to Skiddaw Little Man. As I walked off the higher mountain I noticed the trail of people making their way toward the mountain from the south. It reinforced my feeling that taking the route I did was the right one for this way was a proverbial highway. 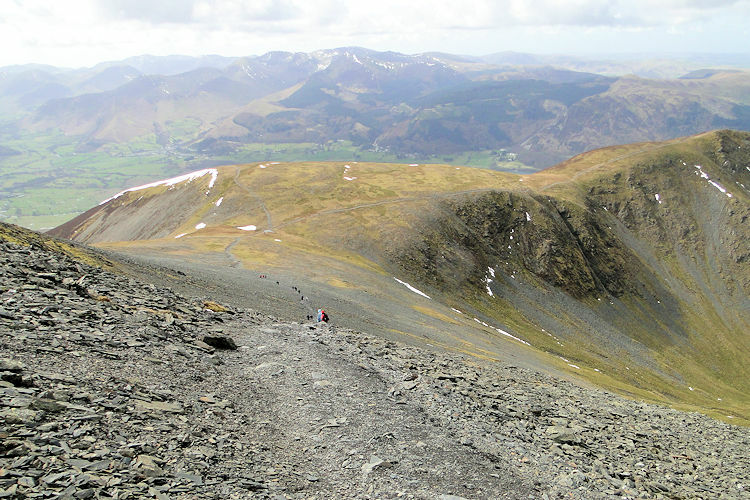 If ever you climb Skiddaw, if you approach from the Latrigg direction you will never be alone. If you want a peaceful ascent then go my way or another but not this. Back to my walk I kept away from the busy path and bee lined to Little Man. 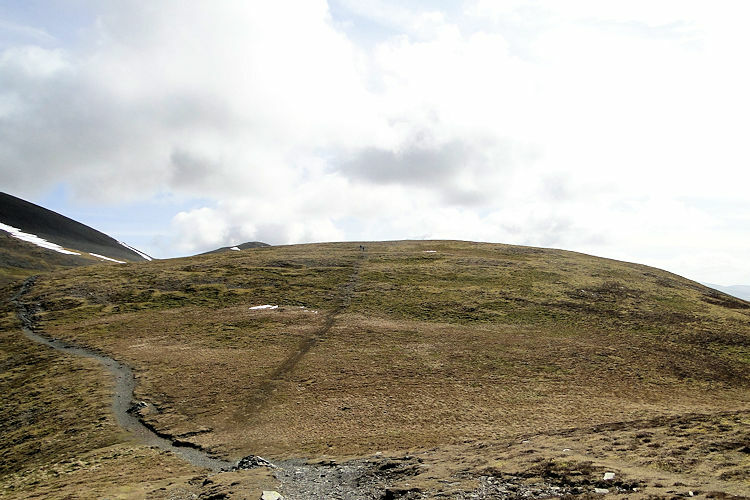 It was a roller coaster walk first gently down off Skiddaw to a dip then gently up a grassy slope to Little Man summit. At the top I did not dwell long for I wanted to push on to Lonscale Fell. 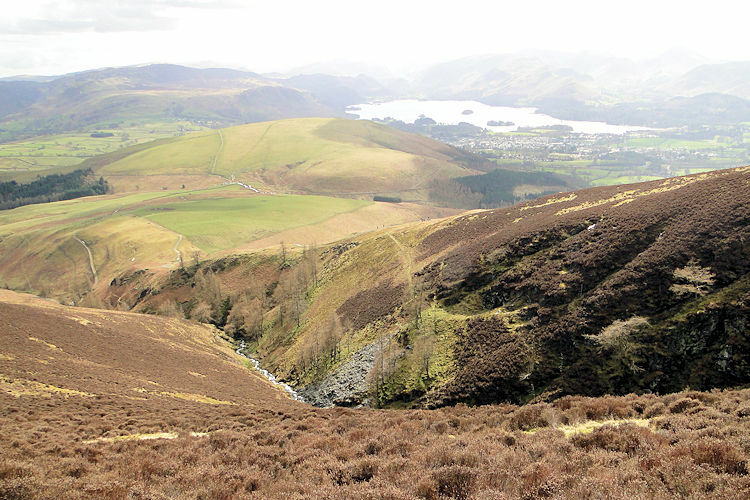 After leaving Little Man I walked to Jenkin Hill and straight across the busy Latrigg to Skiddaw Highway. 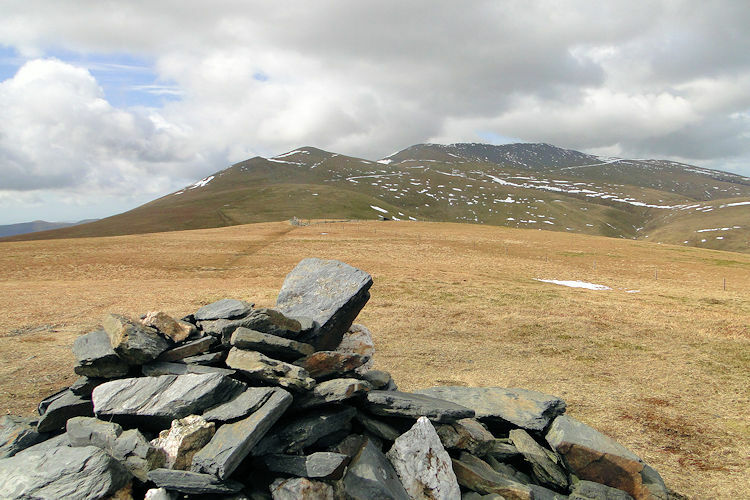 I was exhilarated but tired as I headed across the lush ground of Jenkin Hill to Lonscale Fell. The draw of my sixth and final Wainwright of the day and unveiling views of Blencathra beyond were a suitable incentive. As I made the final push up the fell to the highest point of Lonscale I looked back and saw a couple in familiar gear. "Is it them" I though. 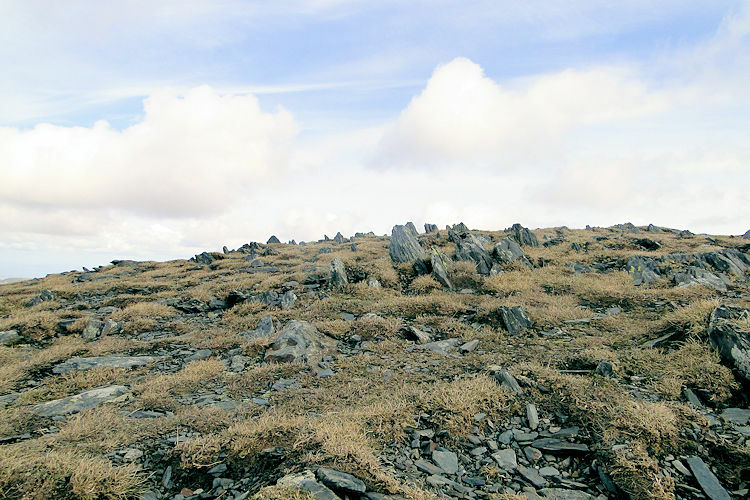 At the small summit cairn of Lonscale Fell I took a break and my suspicions were confirmed. The approaching figures were the couple from Eastbourne. When they reached me one of them said "I bet you think we're stalking you!" We laughed. After the chat on Lonscale Fell I took my leave and set off for the finish of the walk. Trying to avoid the crowds as much as I could I stuck with the uplands of Lonscale Fell but was soon forced off by thick heather and thus I headed for the busy Victorian path and take an accompanied walk to the finish. And so I did, at least with lovely views of Keswick and Derwent Water to partially drown out the noise of chattering families descending from Skiddaw to Latrigg. Soon I reached the car park at Latrigg where Lil was waiting for me in the car. 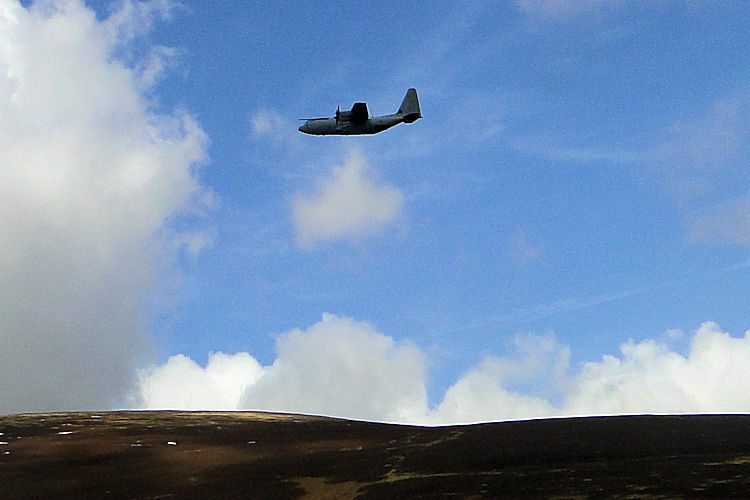 As I reached her a military aircraft flew past on a crossing of Skiddaw. Celebratory or what? 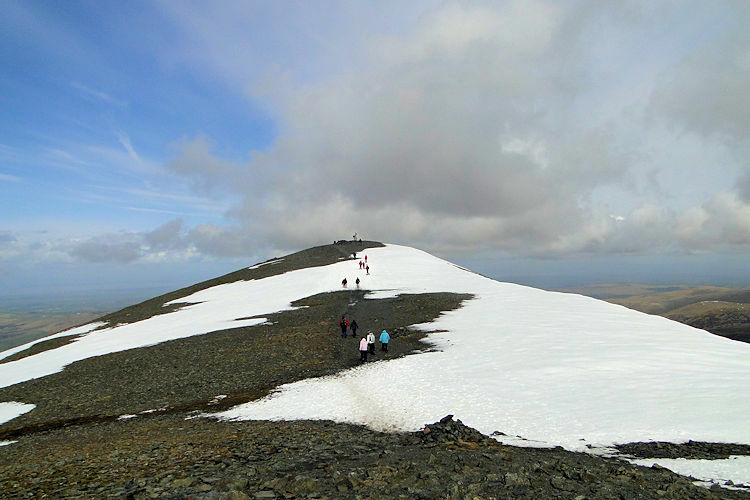 If you do get the opportunity to do a linear walk on Skiddaw then do this walk. If not, I suggest you avoid going from Latrigg. Unless you like crowds that is. For me, crowds are for the streets, mountains are for peace and quiet to take in the sublime views they have to offer. And today I got many sublime views.